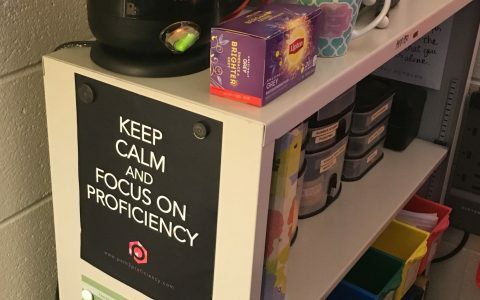 For me, a lot of work went into the paradigm shift that is proficiency-based teaching, and the next step was educating myself on the ‘when’ and ‘how’. I knew that before I could teach it I had to know it backward and forward. Teaching it, in turn, reinforced it, and I continue to learn and see it more holistically every day. Then, at TELL Collab 2015 (left), I made it my E.P.I.C. 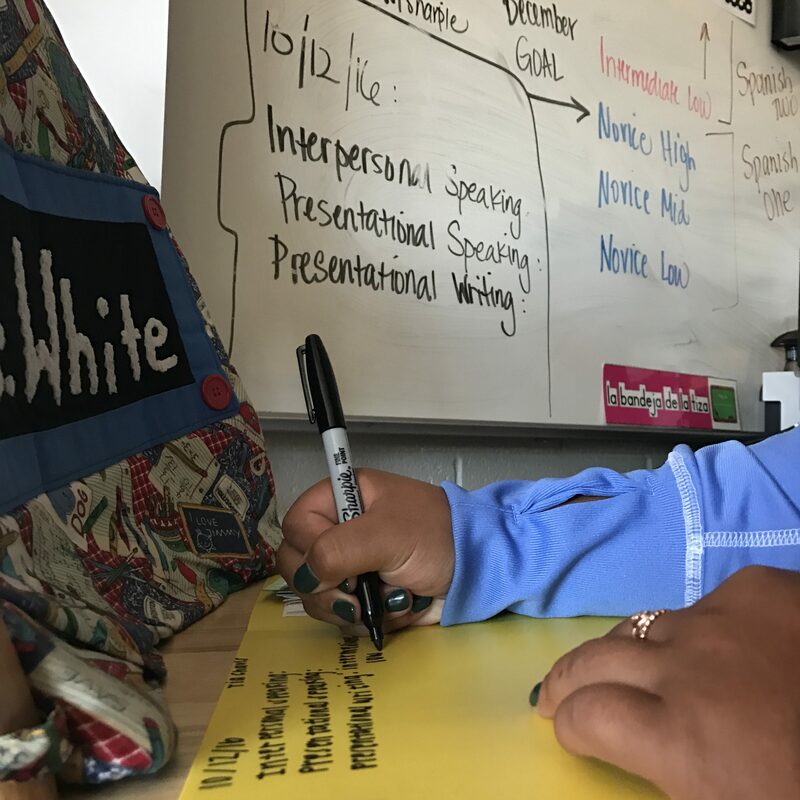 teacher goal to “make proficiency levels and performance routine, accessible, and empowering for my students.” My 2016 goal (right) was then to not just do it but then do it more frequently. But first, I had to figure out what the heck to do and where to start. Back in 2015, I explored and studied these resources from Shelby County Schools in Memphis. There are proficiency explanations in parent- and student-friendly language as well as curriculum examples and much more. Click around, there’s a LOT and it’s refreshing that they share graciously and openly. I’m currently on a block schedule, so tomorrow (January 5) is much like the first day of school. My class rosters as of this moment are all at 36, and I’m getting back about 27 of my students from Spanish I; the rest will be new to me and to Spanish II. We’re starting fresh! The very first thing we’ll do is the warm-up, in two parts: first part SNL video with Alec Baldwin in French class and a couple of brief reflection questions; second part “Noticias del Día” where I took screenshots of the news (some examples here) and will take it from an interpretive listening (reading the headline, taking out the names, and they match the picture) to then verify their answers and use it as an i+1 interpretive reading. This second part is a new addition to their warm-up sheet where I will use headlines every day in a number of different templates, either matching the headline picture as a listening, or a quick-write with just the pictures and some scaffolded vocabulary, etc. – the list goes on, there are lots of possibilities. 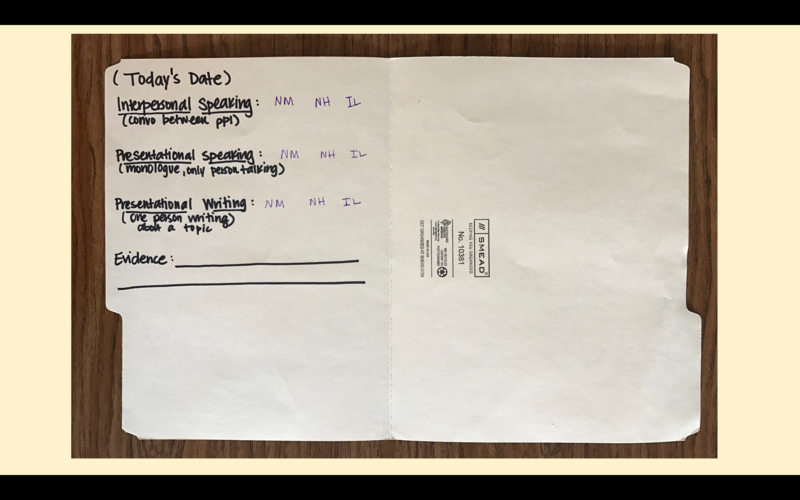 After we do those and I can circulate and see where we are (namely the students I don’t know yet), we’re going to transition into explaining proficiency and getting their portfolio folders set up. My students will already have theirs from Spanish I, but the rest will not, nor are they familiar with proficiency. (Folders are from Amazon, color-coded by class.) This semester my students are in Level II so our goal is Intermediate Low by May 19th – hopefully, they are all at or within an arm’s length of Novice High, so the first couple of weeks will be spent checking that. I will then use the ACTFL YouTube channel to show them proficiency examples in English at several different levels after I explain what each level means and what the indicators are. I have also condensed three of the aforementioned Shelby County resources into one two-sided piece of paper (below) that they’ll then staple onto the inside of their folder for future reference, and to self-assess where they think they are now and what that means. 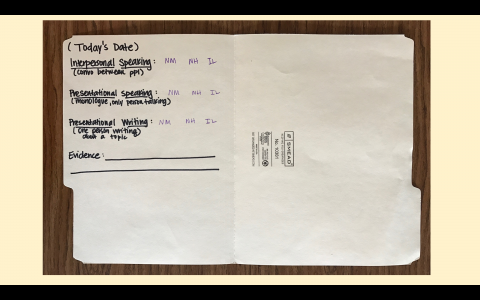 Lastly, after we’ve set up their folders, they have written self-assessed using YouTube examples, indicators, and my explanations, they will complete their exit card which includes proficiency questions to formatively assess their understanding. 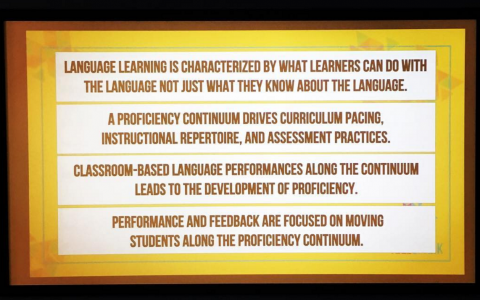 Proficiency isn’t easy for teachers to learn and it can be really abstract for students to get a handle on. I find that a thorough but succinct explanation, multi-modal examples in English, and self-reflection really helps them grasp the jargon and meaning behind it. So, then what? In the next couple of weeks, I’m going to formulate some questions and tasks that I think will indicate their proficiency level and of which they should be capable after Level I last semester (fingers crossed!). 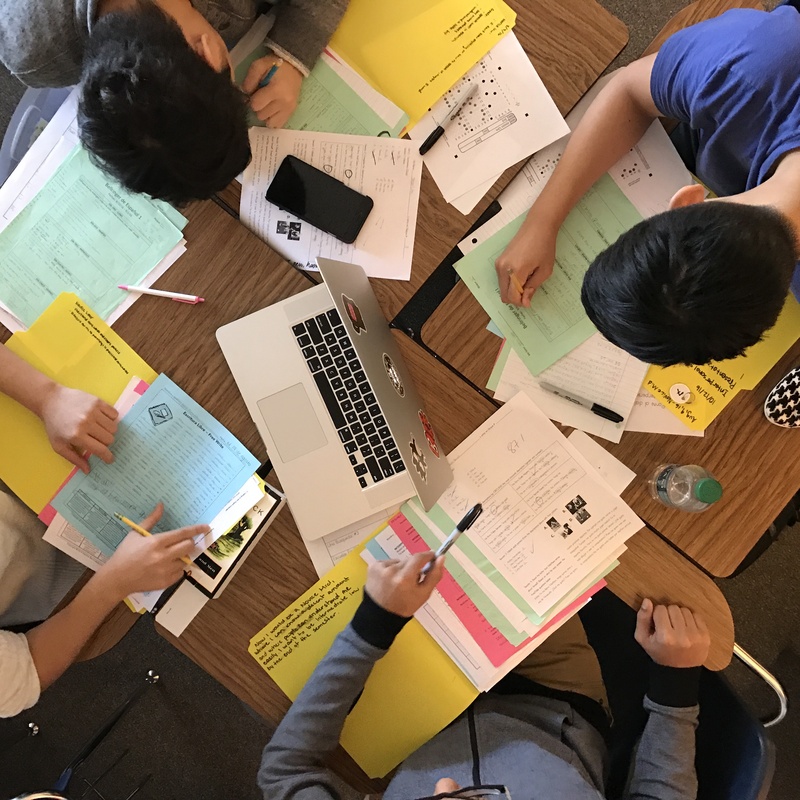 If I think someone self-assessed at Novice High but after a few class periods I see s/he can only list things, or understand questions but respond in one-word answers and/or other Novice Low/Novice Mid indicators, I will manually go into their folder and circle that level and date it. That way, their self-assessment is next to my assessment, and we can see what happens from there (figure out why the gap occurred, and so on). 1. 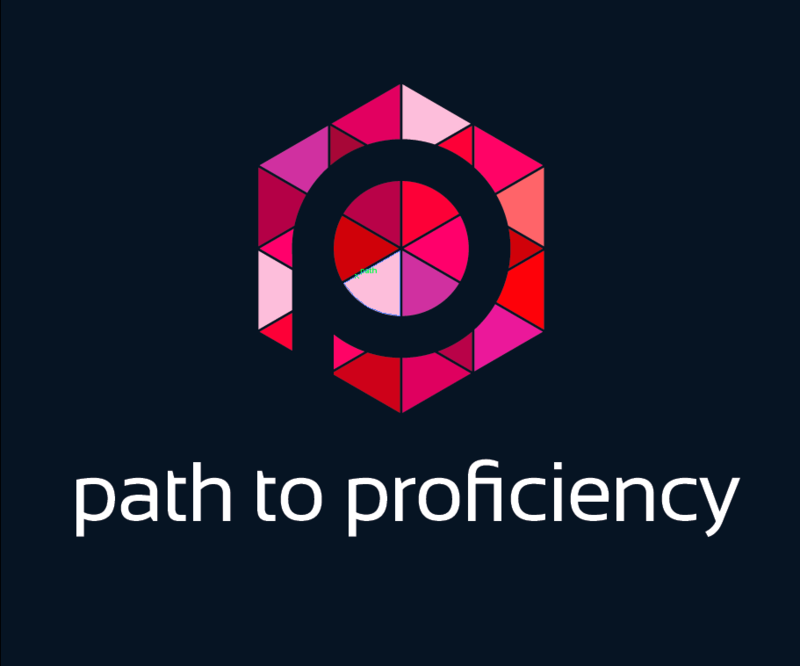 Explore proficiency resources and really dive into your own mastery — practice explaining it to a friend or significant other in layman’s terms. 2. 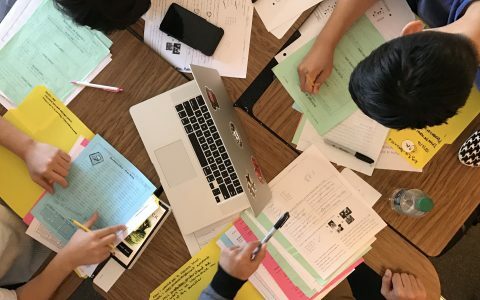 Decide how you want to compile students’ proficiency information: physical folders, online student blogs, electronic school dropbox, whatever. I like the physical folders AND our class/student blogs for this, working in tandem. 3. Put it all together in a concise, streamlined order that flows for YOU – see the comments for the link to my Week 1. 4. 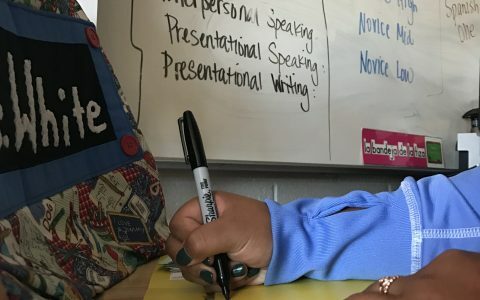 Make sure students reflect and put proficiency into their own words at some point SOON, be it verbally to you, or on an exit card, and then do it again the next day, and maybe even the next – proficiency must become a part of the classroom language that they and we understand and incorporate without hesitation. Eventually, my students update the folders and have them filled with assessments and feedback to reflect back on and keep their materials in. It’s fun to watch them react with: Holy crap, Señora, look at how easy this stuff was! We can do so much more now! <– Sounds cheesy, actual quote. 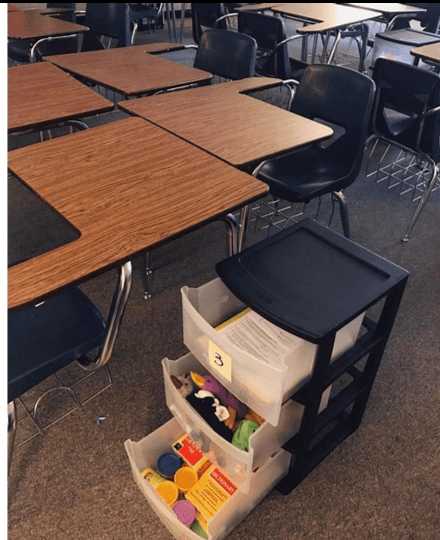 A final note: My students sit in nine groups of four, and last summer I invested in nine group three-drawer group carts that live in the vicinity of their group’s desks. In the drawers live a number of things, but relevant to this post are the Sharpies and mini staplers that come in handy when working with their folders. Also, before class, I go ahead and put four of each color in the top drawer instead of passing them out in class so that I can easily say to open the drawer and give each person a folder, a Sharpie, and a stapler, and voila, it’s done, no commotion during instructions, etc. Got all of it on Amazon, and that bit of investment has made a HUGE difference, especially in classes of 36.) . Thanks for such a great post. This is a wonderful example of how to start a class based on proficiency. However, I couldn’t find the two sided handout of the proficiency rubics attached. Can you post it? I would love to be able to give it to students. Thank you for getting back to me so quickly! I really appreciate this. Thank you so much for the excellent read and resources! What kind of activities do you do in the first week to assess your students’ proficiency? Do you assess all the modes of communication? Thanks! Do you use the same format to talk about proficiency with your Spanish 1s as well? Just change what is on the folder to NL NM NH? Pingback: Same = enough – En français, SVP! This isn’t a very profound question, but I cannot find the video of Alec Baldwin in French class. Was it on YouTube?